Havana is one of the oldest cities in the Western Hemisphere, founded in 1515 by the Spanish colonists. Old Havana is a UNESCO World Heritage Site and was once unquestionably one of the most beautiful places in the world. There are numerous monuments dating back to the colonial times, such as el Morro Castle, el Templete, Colon Cemetery, the Church and Convent of St. Francisco de Assisi and the Palace of the Capitanes Generales. However, there is much more to Havana than its colonial past. It is the only city in the world where you will find vintage American cars used as taxis, ration shops juxtaposed against gleaming colonial palaces and salsa and rumba enthusiastically practiced in the streets under revolutionary slogans. Today you will be collected from your hotel for a private city tour of Havana. You will begin the tour with a drive in a classic American car before exploring on foot. You will travel along the Malecón Esplanade, stopping at the Capitol building area. During the drive you will enjoy panoramic views of the Revolution Museum, The Fine Arts Museum, the Parque Central and the Gran Teatro de la Habana. You will stop at the Revolutionary Square to see the portrait of Ché Guevara and stop for photos at the José Martí monument, the National Library and Revolution Place. It is then time to discover Old Havana on foot as you continue through the alleys and squares of the historic city centre. With your guide you will take in the most important sights such as Plaza de Armas, the Castillo de la Real Fuerza, the Templete, the Palacio del Segundo Cabo and more. Stroll around Obispo Street to see the Ambos Mundos Hotel, Havana’s first university – San Geronimo de la Habana, the Plaza de la Cathedral and La Bodeguita del Medio where you can reward yourself with a legendary mojito at the bar often frequented by Gabriel Garcia Marques, Pablo Neruda and most famously, Hemingway. Today you will meet your private driver who will also be your personal guide during your time in Cuba. You will be collected from your hotel for the journey to Viñales, a small, rural town in the middle of the beautiful countryside, in the Pinar del Rio province. Cuba is famous for its production of cigars and Viñales is famous within this industry for producing the best quality tobacco. The landscape here was once covered by limestone but much of this has eroded away, leaving mountains with steep sides and rounded, tree covered tops. The mountains are called mogotes (haystacks) due to their distinctive shape. You can discuss with your driver the places you would like to visit today. For instance, you could see a mural commissioned by Fidel Castro in 1961. The cliff has been painted with snails, dinosaurs and a family of cave people, in garish colours and whilst hardly authentic, it is certainly interesting. At the Cueva del Indio you can sail in a small dinghy on an underground river through a cave. Minerals deposited on the roofs and walls of the caves have turned the surfaces milky green, rendering the scenery all the more mysterious. Today you will have the chance to see exactly why this region, and in turn country, is so famous for its cigars as you enjoy a horseback riding excursion through the tobacco fields of Viñales. As part of the tour you will visit a local tobacco farmer who will treat you to a cup of Cuban coffee and fresh fruit, while explaining the entire process of turning tobacco seeds into the famous Cuban cigars. Following the tour of Viñales you will continue to the eco village of Las Terrazas, located in the Sierra del Rosario mountains. Las Terrazas is part of an ambitious reforestation project dating back to 1968 which was a set up by the Cuban government and UNESCO, in order to restore the ecological balance of the region which was effected by centuries of coffee plantations. Las Terrazas has lovely natural scenery and is a great place for hiking and bird watching as there are over 100 different species found here. Today you will enjoy a guided tour through the natural park of Las Terrazas. You will explore the ruins of the Buenavista coffee plantation, learn about the region’s history and a small local community. You will end the tour with a refreshing swim in the San Juan river. The remainder of the day is at your leisure and it is possible to do some hiking through the hills of the area, to enjoy the most scenic views of the natural park. Thrill Seekers can do zip-lining over the treetops and the lake. Today you will travel to Cienfuegos, often referred to as the Pearl of the Caribbean. 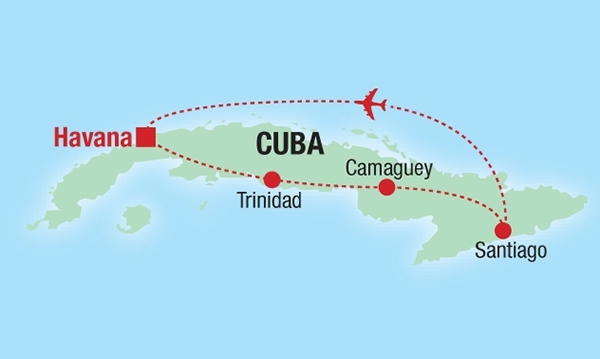 En route you will visit the Bay of Pigs, where Americans once tried to invade Cuba. They did not succeed as Fidel Castro led the Cuban army to victory. There is a lot of history in Cienfuegos, reflected in the racial mix and architecture of the Pearl of the South. You will see broad neoclassical boulevards and art deco façades and this architectural style is due to the many French colonists who settled in Cienfuegos after they fled Haiti during its independence war. There is also a strong Afro-Caribbean presence here. 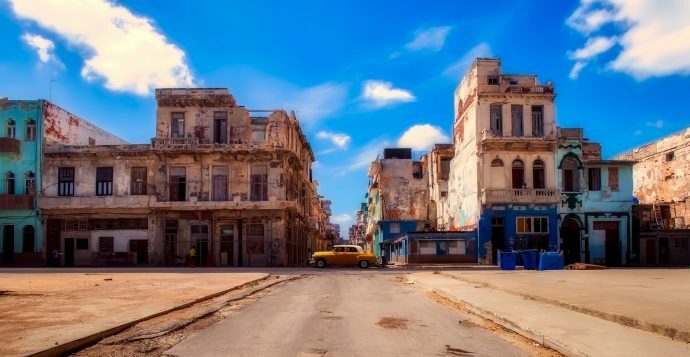 From Cienfuegos you will drive to Santa Clara, the site of the decisive battle of the Cuban Revolution, where Che Guevara defeated the government forces of Cuban dictator Batista. The mausoleum of Che Guevara is located just outside of the city in honor of the iconic revolutionary. You will then continue to Trinidad, where the cobblestone streets contain a treasure-trove of small and grand colonial buildings, churches, quiet squares and beautiful plazas. Trinidad is known as Cuba’s Museum City as for a small town, it has an impressive collection of museums. All are set in fine examples of colonial architecture within the UNESCO-listed old quarter. Of particular interest is the Museo Romantica, crammed with antiques, the stunning Museo Historico de Trinidad and for a background to the Communist Revolution, the Museo de la Lucha Contra Bandidos. A walk through the town feels like travelling back to colonial times. Today is a free day for you to explore Trinidad at your own pace. You can swing by Plaza Mayor and the picturesque, yellow-and-white domed bell tower of the old San Francisco Convent, before finishing up your walk at the little tavern La Canchánchara, housed in a mansion dating from 1723. La Canchánchara is named after a famous drink from the region, made from lemon juice, honey and Cuban rum or aguadiente, served in glazed ceramic pots. In the evening, you can listen to great live music at the “Casa de la Trova”. Today you will depart for the colonial, and historically significant, city of Camaguey. The beautiful Spanish core (a UNESCO World Heritage Site and currently being restored) sits in a labyrinth of serpentine streets so built to confuse attackers. There is an 18th century cathedral with an unusual Moorish roof and a cloistered hospital transformed into a hotel. Picturesque Plaza San Juan is graced by the national theatre and paved with original cobbles. Today you will drive from Camaguey to Bayamo, the birthplace of the Cuban anthem, as well as one of Cuba’s founding fathers, Manuel de Cespedes. You will have time to explore this historic Cuban town, before continuing to Santiago de Cuba, with a visit en route to the basilica of el Cobre. Santiago de Cuba is nestled between the high Sierra Maestra Mountains and Caribbean coast. The second largest city in Cuba is the home of legendary rum and birthplace of the revolution. This cultural capital has been instrumental in the evolution of Cuban literature, music, architecture and politics. Santiago is buzzing with a cosmopolitan mix of Afro-Caribbean culture. Today is a free day for you to explore Santiago at your own pace. Why not stroll through Park Céspedes, a gathering spot for Santiagueros young and old to play chess, make music or sit on a bench to gossip and people watch. You have the option of taking a ferry ride to the UNESCO World Heritage site El Moro Castle, built to protect the city from marauding pirates. The site offers breath-taking views of the bay. There is also the famous church El Cobre, where people pilgrimage from all over Cuba to ask the deity’s help and return to thank her. Today you will be transferred to the airport where you will say say goodbye to your driver and board your flight back to Havana. Upon arrival at the airport, you will be collected and transferred to your hotel by private taxi. Once you have checked in, the remainder of the day is at your leisure in Havana. Sadly, your time in Cuba has come to an end. You will be collected from your hotel and transferred to the international airport to board your onwards flight. Diese Tour startet mehrmals im Monat und beinhaltet 12 Übernachtungen in Hotels.